Soil and garden compost as a bulky ingredient in seed and potting compost. All the plants pictured today are grown in containers of soil that have no extra ingredients other than fertiliser and occasionally lime. I am playing with fire today when I suggest unsterilized garden soil might be used in a pot! For forty years in my lectures I declared that you must never grow pot plants in soil from the garden! When we moved to Seaton Ross fourteen years ago I found that my soil to be an extremely fine water retentive sand. I tentatively started to use it as a substitute for regular potting compost and liked what I saw. It is very rare now that for other than very special purposes I use anything else. 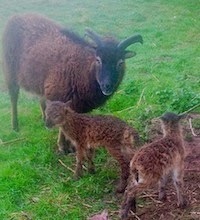 When I started blogging I wrote a timid little post about this. It was called ‘Pot compost, breaking the rules’. My posts were edited then and I am grateful to Cathi who struggled a long time to make that piece intelligible. I don’t even know if pot compost is a proper name, but I rather like it! I will be more forthright today! First for my American readers I must explain that strange word ‘compost’. In the UK we use it with two separate meanings. Most of us are besotted with ‘garden compost’ from garden waste that has decayed in a heap, unsightly wooden/wire structures, or in a bin. We also use the term ‘compost’ for mixtures in our seed trays, pots and containers and call them either ‘seed composts’ or ‘potting composts’. Of course in ancient times garden compost and potting compost were exactly the same thing. For my purposes today I am treating ‘garden compost’ and ‘soil’ as synonymous terms for these two bulky ingredients in a seed or potting compost. This is not quite correct as both can be separately used and are not the same! Garden compost is bulky material in various stages of late decay and might contain a little soil from the roots of composted plants. The organic matter will eventually decay away to carbon dioxide and water, beneficially releasing its nutrients, but not lasting forever! Actual soil can be used and reused many times. Unless garden compost is very well decayed it will be far too rich to be used exclusively as a bulky ingredient. My first choice material is organic-matter-rich fertile garden soil with a suitable texture. Soil in compost has a very long history. John Innes compost has a fine pedigree and was the ascendant compost in horticulture for perhaps sixty years. More than 50% of the volume of this compost is sterilized loam. Loam was defined as a soil with suitable proportions of sand, silt and clay and fibrous material and it was prepared from lifted, stacked and decayed grass swards. This soil was sterilized with steam before making up the compost. Properly prepared John Innes was a wonderful compost. Modern versions are often a pale shadow of its former self although we do have the advantage today of slow release fertilizers unavailable to its inventors Lawrence and Newall at the John Innes Institute almost a hundred years ago. Loam for John Innes was sterilized with steam to control pest, disease and weeds. Because it killed almost all soil bacteria, the new micro-organism profile which developed in consequence enhanced the release of soluble nitrogen and this was at the time considered an advantage. My comments today are about unsterilised soil. Some modern thinking is that an undisturbed micro-organism profile of fungi and bacteria in a natural harmony might be a good thing. Probably misguidedly, many gardeners today add mycorrhiza from a packet! The physical structure of specially prepared loam is not usually suitable when used alone for potting compost and the John Innes formula adds sharp sand (more latterly grit) and granulated peat for water retention and aeration. Both are still superb ingredients for gardeners who make up their own soil based compost. The slow release nitrogen fertilizer in traditional J.I. compost was hoof and horn meal which as it broke down acidified the soil. In addition with peat as a component, lime was required. This is less relevant now and if the pH of the soil in the ground is satisfactory the same applies when it is used in a pot. In my own all-soil compost if I judge to need lime I add dolomitic limestone. John Innes composts went out of fashion as they were expensive to prepare and soil supplies were limited and variable. Also, with the then available fertilizers, and as a result of the nutrient boost which was a consequence of sterilization, they deteriorated in storage. They were superseded by wonderful peat based composts which in particular were superior for propagation. I do not share many folk’s fashionable reservations about peat. I will not explain the reasons for my opinion today but I fully concur with the opinions here. Amateurs and some professionals never properly understood the water management of peat based compost and I do not miss dried out hydrophobic compost when I buy plants from the garden centre. There are some really excellent peat free composts nowadays but others are rubbish and present numerous management difficulties. As I never use them I am completely unable to advise which to buy. Many potting composts today are based on commercially composted green wastes and the product is very variable. Perhaps you get what you pay for. Composted green waste has many legitimate garden uses but only that produced by very well controlled systems is suitable for potting compost. I do not approve of shipping compost materials half way round the world to find substitutes for peat. So what heresies am I advocating? I cannot promote my own methods carte blanche to use soil in small pots and seed trays. My own soil, almost uniquely, has a satisfactory texture. Most soils, especially clays are completely unsuitable. 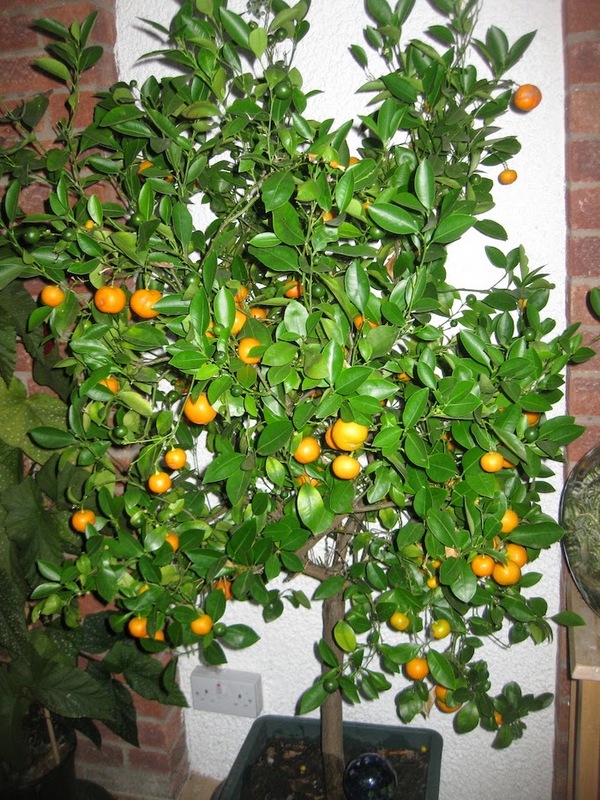 Where I do part from conventional opinion is for growing plants in large containers, perhaps those greater than ten litres. A lady at the bridge club the other day asked me to recommend a compost for her bourgeoning olive. I was completely at a loss to give her sensible options but after quizzing her closely, discovered she had highly organic well drained garden soil. Eureka! Visiting my son in Sorrento I noticed all garden ‘planters’ were filled with their native volcanic soil. Not all gardeners have suitable soil to use as the sole bulky ingredient in a large container, but in my opinion, very many do. My comments today are relevant to any gardener who uses unsterilized soil alone as I do, or as an ingredient in a mixture. My ferocious cacti need some care when weeding! I use my secateurs as tweezers! The lily seedlings are also in soil. Unsterilized soil may contain pests, diseases and weed seed. Most soil is not as water retentive as traditional compost ingredients such as peat. Many soils will be insufficiently aerated in shallow containers when wet. Too much clay content will lead to unacceptable hardening, shrinking and cracking when dry. Soil is highly variable in texture, structure and nutrient content and in no way is suitable for mass production methods that require uniformity. Because I can! My own garden soil has properties such as excellent water retention consistent with good aeration. Where large containers with a deep profile are used the physical properties of soil in a container are similar to those in the ground. I use huge quantities of compost and my method is almost free! Soil can be recycled and is not wasted. If you must, you can return the soil to your garden and replace it with some more. Personally I am completely cavalier in reusing refreshed old soil-compost many times over. If you are using your own soil you are not scouring the environment, driving to the garden centre for sometimes fairly dubious materials transported from all over the world. Years ago, we used to compare the then new peat composts with loam based John Innes. The prevailing view, which I admit was disputable, was that JI compost was better for long term culture because of the loam. I tend to concur for plants that are to remain undisturbed for many years. Even peat decays and slowly oxidises away and containers need to be topped up. Not so with soil. Yes I have weeds! I enjoy hand weeding my pots although in the case of large containers of certain plants I can lift up my nozzle and accurately spray them. My own methods in my garden attempt to stop weeds seeding and weedy perennial roots are not present in my soil. I can imagine some soils have so many weed seeds and are wick with wicken (couch grass) that my methods would be completely unsuitable. Plants bought from the garden centre in originally sterile compost are frequently full of weeds and users of ‘proper’ compost have the same problems as I do with liverwort and moss. It would be foolish to use soil contaminated with for example, club root or white rot of onions - especially to grow onions and brassicas! Subsequent planting would spread these diseases around the garden. I have described how ‘damping off’ is not a problem for me and anyway as a disease of seedlings and not of mature plants, is irrelevant to our discussion today. I personally suffer no more or less with disease, unexplained plant death and sickness than I previously did when I used conventional compost. My plants in pots are just as healthy as those in the ground! There are a number of pests that do not like soil but love peaty and soft organic ingredients. The dreaded mushroom fly and vine weevil, a plague with organic composts, are unknown to me. Although my soil is hydrophobic, if I water my compost when it has become dry, because of the container’s retaining rim the water soaks in and fully rewets the soil. This is in contrast with hydrophobic materials like peat that shrink when dry and water ‘runs through’. Heaven forbid that I should neglect the long term nutrition of plants in my containers. Should I be so foolish, my plants, will survive better than those from the garden centre when their slow release fertilizer runs out after very few months. I never thought I would write this! My fur coated helpers kindly leave neat piles of lovely soil on my lawn. I know my soil is of a suitable sand/silt texture and coming from turf will be high in organic matter. Tongue in cheek, I might add that my grey coated friends have carefully picked out the grubs. I am only too grateful to accept their bounty. A word of warning, for most gardeners the suitability of mole soil is illusionary. The moles might appear to be magicians when they appear in our gardens from nowhere, but their magic is insufficient to turn clay into sand. It might look nice and crumbly but if the texture is wrong and without divine intervention it will turn rock hard in a pot! My dear friend and colleague, Tony Thompson, would every year build, as part of his teaching, several loam stacks with the students for future use in making up John Innes compost. The method was to stack sods of turf in layers with manure. The principle was that after decaying for a year or so the decayed turf could be chopped up to a wonderful fibrous loam. The lovely man who was in charge of compost could tell you the year each stack was constructed and we all accepted that when he lovingly described each vintage it was like ‘putting down’ wine. This of course completely misses the point! After all those years the benefits of root fibre and manure would be completely lost. If you have laboured this far today you will sympathise with my students when I tell you that it used to take me three forty-five minute lectures to cover compost! Garden myths discussed. Does bonemeal have any horticultural value? Every time I used to read a gardening article written for amateurs it recommended bonemeal to encourage new roots and fertilise the plants. Whatever the plant, be it grass, bulbs, vegetables, fruit, shrubs, trees and herbaceous perennials it was a panacea and almost mandatory to use it when planting and sowing. Whenever I looked at any professional fertiliser recommendations for each one of these plants there was never a mention. 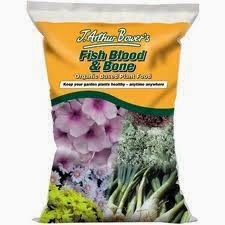 Be it nurserymen in Boskoop, farmers at home, fruit growers in Kent, bulb growers in Spalding or vegetable growers in Lincolnshire they all used fertilisers, usually compound - but bonemeal.....? Not a word! Why was this so? It's not much better now. I have agonised over this conundrum for many years and I have concluded it is so widely recommended because it does very little harm. Gardeners (wrongly) feel it is their duty to put a little something into the planting hole to give the plants a good start. Most gardening journalists apart from believing the myth themselves - it must be right because it is repeated ad nauseam - do not want to give any cause to the gardener to damage or kill his plants. There are people who imagine that if a slack-handful of fertiliser is recommended, either they might have very big hands or are of the mind that if one is good, ten is better. 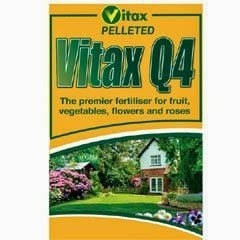 Proper fertilisers contain highly soluble nutrients and too much will damage or even kill plants. 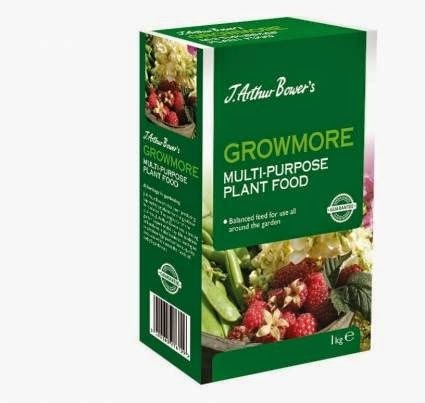 I often recommend Growmore to amateurs, it is a good compromise between too much and nothing (bonemeal). Growmore contains the major nutrients, 7% nitrogen, 7% phosphate and 7% potassium. Better and more concentrated fertilisers are available and these I have recommended in previous posts but clearly the stronger they are the more room for abuse. Just one final salvo before I try to analyse this myth. Bonemeal smells a little acrid and highly organic. It must be doing good! When I say bonemeal is harmless I believe this to be true. The last time I was in Eire (fifteen years ago), bonemeal was banned - something to do with anthrax as far as I know. Thinking about flinging the powder of crushed denatured bones around it amazes me that in the reaction to the very real BSE scare they did not ban bonemeal in the UK. There is a complication here, if you check things out on the net, bonemeal can be used in animal feeds where their are different regulations. Superior to bonemeal, perhaps equivalent to growmore for organic gardeners unless in some formulations its enhanced potash is from an inorganic source. Perhaps you are troubled with taking fish from the sea? So what's wrong with bonemeal? then I have no objection to it at all. If you learnt on your mother's knee (she will be well over a hundred now) that bonemeal is an excellent fertiliser events have overtaken you. Modern methods extract all the goodness from bones and you buy the debris. Bonemeal needs to be mineralised - that is worked on by bacteria - before any soluble phosphate is available at all. If the pH is more than seven it will be immediately locked away and even when the soil is acid, one study showed the nutrients took more than ten years to be released. One enterprising vendor took a positive view and advertised ten years supply in one go! Mike Ashford my botanist friend described adding bonemeal to the soil as a form of pollution. I know no professional colleague who ever uses it. I would not put it on my garden if you gave it me for free! You have perhaps by now have decided I might be a little biased. I hope I have not given the impression that I have something against phosphate. It is a major nutrient required for the development and function of every plant cell. It is contained in almost all compound fertilisers but it is not usually necessary to provide it separately as a single nutrient fertiliser. It is particularly important for seedlings and young plants. It is not for nothing that superphosphate is the sole fertiliser ingredient of John Innes seed compost - not used now and superseded by loam-less seed composts, it gave fabulous service to amateurs and professionals for more than fifty years. Although most phosphate fertilisers (other than bonemeal) are more or less soluble when they are used on the soil, in a matter of weeks they become chemically 'locked up' and much less available to plants. An equilibrium exists between ‘locked up’ phosphate and small amounts dissolved in the soil water. The available nutrient is effected by acidity and alkalinity, is optimally available between pH 6 and 7 and where temperatures are sufficiently high. Phosphate in the soil is like capital in a bank that remains in place (dream on), and small withdrawals are made. The consequence of this is that in the soil, phosphate, in effect, acts as it's own slow release fertiliser. Perhaps only 20% of phosphate added as fertiliser, is used by the current crop. The remainder remains as capital in the soil 'bank' for future years. Most UK soils have more than enough phosphate and need no more for several years! Because phosphate becomes locked up in the soil, it is not very mobile and tends to stay where you put it. That's one in the eye for none diggers like me who top-dress only and do not work fertiliser in. My numerous worms relocate the absorptive soil and the roots come to the surface without being chopped away in my undisturbed soil. Another consequence of the low mobility of phosphate is that not only does it not readily wash into the soil, it does not leach out. Unfortunately this does not always prevent water pollution if soil particles are eroded by wind or water, or phosphate from decaying organic matter left on hard surfaces runs straight to the drains. In early May, Peter William's commented that he had never before seen such intense purple-leaf symptoms of phosphate deficiency on my tomatoes! (sorry no picture). After being planted in my greenhouse at the end of April there had been a spell of rather cold weather and the air temperatures in my greenhouse were almost zero centigrade. Warm weather returned and my soil supply of phosphate became available and now in late May my tomatoes are fully recovered. A little known fact in the UK, is that many Australian soils are naturally deficient in phosphate and some plants from that continent have evolved with a low phosphate requirement. In a very limited number of cases in UK soils, such plants have suffered from phosphate toxicity. Have I been fair to bonemeal? Probably not. It was a cheap jibe about it locking up other nutrients. That is a property of phosphate and not a specific fertiliser. Indeed the fertiliser superphosphate is sometimes used to lock up heavy metals that are potentially toxic. As to it's effects on root growth I was perhaps over-anxious to counter the usual baby talk that phosphate is for roots when I fully admit that phosphate is good for the development of young plants (pity that bonemeal provides so very little). Although the release-rate of phosphate from bonemeal is hardly perceptible that is not little different to the effect of normal phosphate when it is locked up in the soil. It is generally recognised that fertilisers reduce mycorrhizal associations forming. The release rate of phosphate from bonemeal is hardly enough to make any difference! No, not the one about West Hartlepool Parks Department making their own version of John Innes compost with bonemeal when I was an apprentice. No, not the one about nearly coming to blows in a pub. No, not the one about plenty of bonemeal in my cemetery gardens. In the early seventies we took the students to see the turf at Headingly cricket and rugby stadium. The new groundsman was scathing about his predecessor's use of bonemeal. He had had the soil analysed and rhetorically declared that there was enough phosphate stored in the soil to last to the millennium. Wonder what happened in 2001? My current professional fertiliser. Brother-in-law Dave recently bought 25kg from my sundries supplier for £22 to share with fellow allotmenteers. As a hard prill formulation it stores very well. It was meant to be Chelsea! Julie Williams advance-purchased train tickets for the five of us before finding Chelsea was fully booked! So we went to Kew. To assuage Julie's embarrassment when Brenda subsequently tried to arrange a different jaunt to London Open Squares Gardens, she purchased the tickets for the gardens, booked Waterloo Travelodge on a none-refundable deal before finding the gardens were open the following week. We did the Jubilee Walk instead! You just can't get the staff! We arrived At Kew Tube Station and ate a hearty breakfast outside in the morning sunshine before confidently wandering down to the gardens secure that each one of us knew the way. We walked about half a mile 180 degrees in the wrong direction. A perfect start to a wonderful day! As we entered the garden Peter and I reminisced how fifty years ago we went in for a penny. Not anymore! Before I embark on describing some scenes in this fantastic and wonderful garden I ought to explain why some of my comments are rather ungracious and carping. It's more that I want discuss a few interesting technical considerations rather than complain. To manage such a huge and sophisticated garden as well as they do is no inconsiderable achievement. Take labelling. Another (unnamed) botanic garden I visited recently had a number of misplaced labels. Spring bulbs had died down to be replaced by the new growth of Summer plants. It was very confusing. One could also see a bulb labelled miscanthus when this tall grass was actually emerging two metres away. It's very difficult when untrained staff and worse Joe Public rearrange labels. An absolute nightmare. For Kew it was a minor sin, when in a display bed I found a corydalis wrongly labelled as the related adlumia. Shades of schadenfruede, I am ashamed to say. I felt a frisson of satisfaction. The ducks think the flower urns are nests. Is tattooing trees a new trend? Fascinating story how neglect in a Victorian nursery determined the tree’s shape. It gives me hope for my own misdemeanours! A wonderful place to bring children for stimulating projects. Hard work for the teachers. These diligent students are being very good not to walk on the soil. Last time I went to Oxford Botanic Garden, Marilyn, Dave and Brenda shouted at me and gasped in astonishment when I walked on the fluffed up soil to examine a plant. They don't give my own sophora the same degree of attention. Two of of the things wrong with traditional herbaceous borders. Over-staking and weeds. I find it difficult to believe in a hundred years they have not eliminated common bindweed. On reflexion perhaps I malign them, maybe it’s the more innocuous annual black bindweed? Dicentra formosa oregona 'Silver Beads is a perfectly nice dicentra but if there is any difference to Dicentra 'Pearl Drops' and 'Langtrees' it is beyond me. Perhaps it is a dwarf form or just growing poorly? I wonder if it is characteristic of 'Silver Beads' to have those pink flowers or is it reverting? Better try it again in my National Collection. They sometimes say garden maintenance in public places is boring. How could it be so in such a beautiful place? Did the automatic humidifiers or overhead watering system break down on a very hot day? I sometimes think that plants should be displayed, worts and all, as they really are in the jungle! There are many fine historic buildings in the grounds. 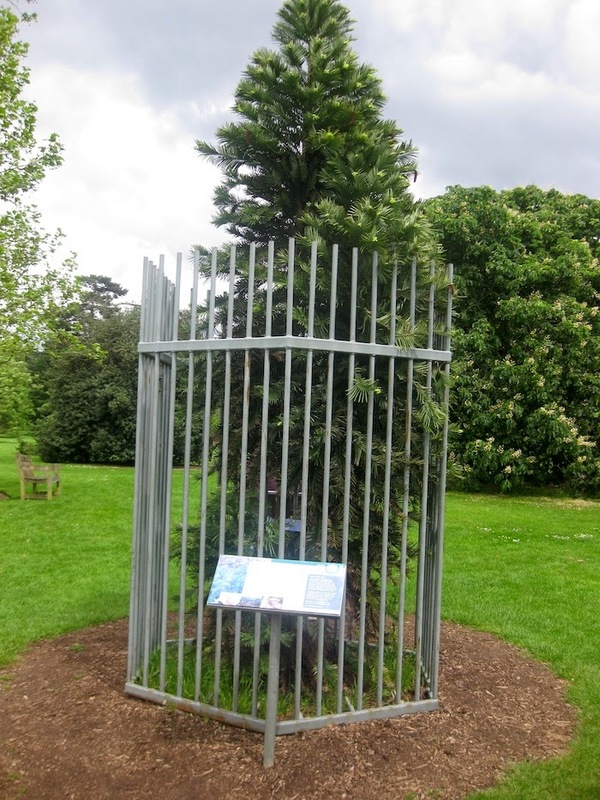 They want to make sure that the 'fossil tree', the Wollemi Pine does not escape. Does it walk like a triffid? There are many fine specimens of those other two fossil trees in the grounds, metasequoia and ginkgo. They are a bit big to get through the gate. By the time we got here we were a little tired and failed to investigate. Wonder what we missed? This tree would be a very good visual aid for a lecture on tree compartmentalisation. You can see how the branch is a very distinct structure from a trunk and where on the shoulder a pruning cut should be made. What a wonderful garden! What beautiful spacious parkland and grounds. The further you walk away from the gate and explore into the hinterland the more natural it seems to become, albeit, or should I say because of, the plants of the world are growing together. As a result of the artifices of skilled management and careful planting the plants seem to belong there. Tens of thousands of different plants are preserved in the grounds. This is just the tip of the iceberg with regard to the conservation work done by Kew. Worldwide their staff seek out endangered plants and habitats and by advice, education and persuasion help to preserve them. Sometimes natural habitats no longer exist and plants can only be preserved by moving them around the world and growing them in gardens and new ecologies. Moving plants around the world is what Kew has been good at for the past 250 years. Think of all the plants, food crops and commodities that have passed through their hands and literally have changed the world. 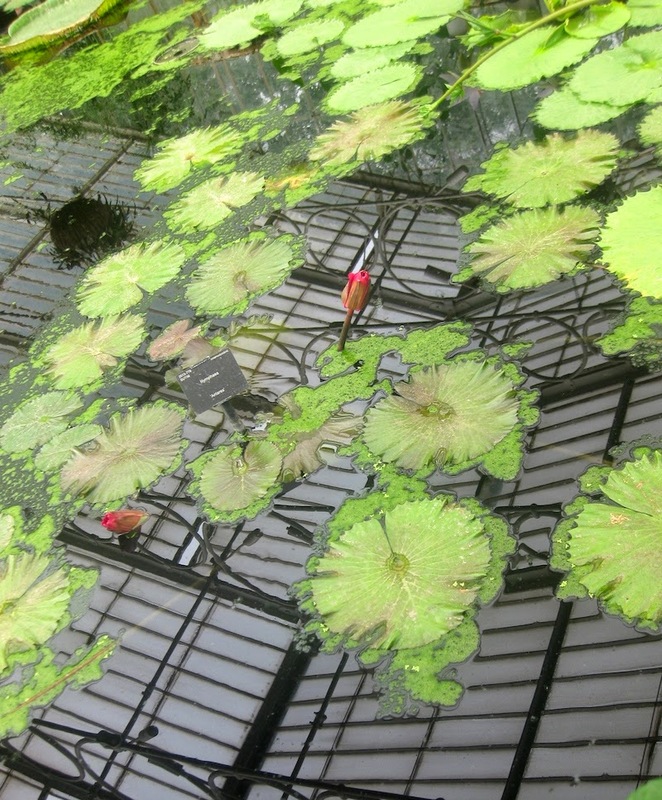 You do not have to be a gardener to appreciate Kew. The garden contains historic buildings, monuments and greenhouses. The buildings provide for administration, research laboratories, preserved plant collections, gene banks of seeds and educational facilities. 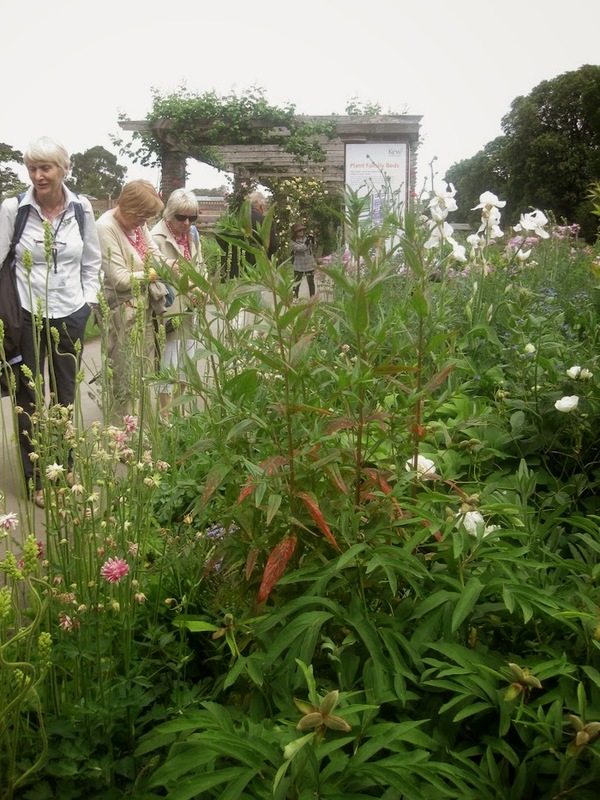 Kew educates and trains gardeners from all over the world. The plants in both the historic and new state of-the-art greenhouses are just amazing. 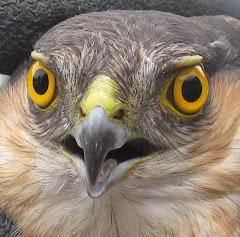 It is tragic that Kew’s grant from the state has been reduced yet again. The value of trade in plants that Kew have given the world would pay for the annual maintenance of the garden hundreds of times over. I wish the British public appreciated Kew more. It should be top of any list as a garden to visit in London. ‘Other places’ might display huge skill in short term display, publicity, hype and television coverage. British horticulture is magnificently represented at Kew!